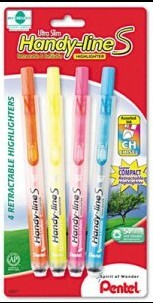 This super-compact retractable highlighter features an ultra light and slim barrel for writing comfort. The rapid ink flow delivers bright and clear highlights - so you'll be able to quickly spot your important notes. The tip continues to stay fresh and moist with the advanced seal technology. Made of 54% post consumer recycled content. Smooth & easy retraction action!